CANTON, Mass. (June 10, 2014) – Dunkin’ Donuts is celebrating Father’s Day this year with a fun and delicious donut to make Dad feel like a star on his special holiday. 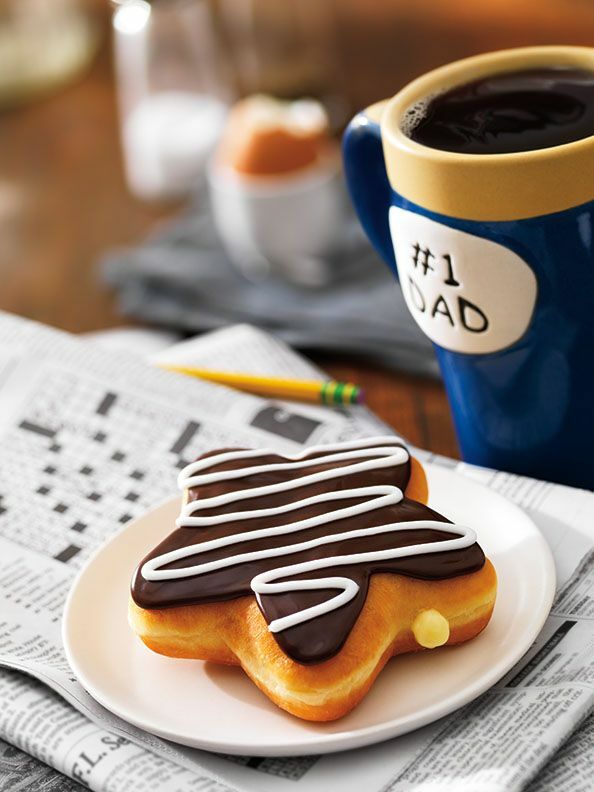 For a treat tastier than a traditional tie, Dunkin’ Donuts, America’s all-day, everyday stop for coffee and baked goods, is offering the #1 Dad Donut, a star-shaped yeast donut with Bavarian crème filling, chocolate icing and a white icing drizzle. The #1 Dad Donut is available at participating Dunkin’ Donuts restaurants through Father’s Day. In addition, Dunkin’ Donuts is offering a “This Dad Runs on Dunkin’” tumbler to help Dad enjoy his fresh-brewed coffee at home or on the go. The 16-ounce tumbler is top rack dishwasher-safe, and is perfect for fueling Dad at work or play, all day long. The tumbler is available at participating Dunkin’ Donuts restaurants nationwide. Guests looking to keep Dad running with Dunkin’ Donuts food and beverages long after the holiday can purchase limited-edition Father’s Day virtual Dunkin’ Donuts Mobile Cards, available in several fun designs. Dunkin’ Donuts Mobile Cards can be sent via email, text message or Facebook through the mGift feature on the Dunkin’ Donuts mobile app, available for both iPhone and Android smartphones. With the mGift feature, users can send a variety of virtual Dunkin' Donuts Cards, which can be redeemed directly from a mobile phone at participating U.S. Dunkin' Donuts locations. All Dunkin' Donuts mGifts can also be added directly to the Dunkin' Mobile® App, reloaded right from the phone, and used as a fast, convenient way to pay. Along with Father’s Day themed items, Dunkin’ Donuts recently launched the new Grilled Chicken Flatbread Sandwich. A permanent addition to Dunkin’ Donuts’ sandwich lineup, the freshly made-to-order Grilled Chicken Flatbread Sandwich features lean, juicy grilled chicken, ancho chipotle sauce and reduced fat cheddar cheese, served on a multigrain flatbread. At 360 calories, Dunkin’ Donuts’ Grilled Chicken Flatbread Sandwich is the latest addition to the brand’s DDSMART menu of better-for-you items. Finally, whether or not Dad’s special day involves some time on the golf course, Dunkin’ Donuts has a perfect drink to keep cool on Father’s Day and all summer long with the Frozen Arnold Palmer® Coolatta, a refreshing new way to enjoy the original half iced tea, half lemonade beverage. Dunkin’ Donuts is also offering a frozen twist on the classic OREO® Cookie as well, with the return of the OREO® Coolatta, available in OREO® Frozen Coffee and OREO® Vanilla Bean varieties.